If you’ve been following the most recent installments of In Rotation, you’ve no doubt noticed the way Outlander has drawn me in and then pushed me away from its sweeping tale of love and torn loyalty across time. I enjoyed the start of this series, based on the books by Diana Gabaldon, and the way it took the stuff of a trashy romance novel, placed it within a sci-fi/fantasy framework, and treated it with utmost seriousness even when the material itself was inherently campy. However, certain character reveals towards the latter half of the season, and especially the last two episodes of Season 1, made Outlander feel uncomfortably retrograde and morally careless in the way it depicted historically marginalized people. I felt ready to give up on the series, but decided to stick around in the hopes that it might win be back. Boy did it win me back. Outlander Season 2 is great. By the time it hits its stride with the last three episodes, it is some of the best, boldest, and most satisfying television I’ve ever seen. I kept coming back to thinking about Damon Lindelof’s The Leftovers as I was watching this. That was a show that similarly had its ups and downs in the first season, including one narrative turn that felt cheap, exploitative, and cynical to its audience in a way that angered me in the same way as the Jack Randall character did here. However, that was also a show that became something different in its second and third seasons: something beautiful and moving and deeply bold in the bizarre choices it was making artistically, unlike anything else I was watching at the time. Season 2 of Outlander isn’t entirely free of what I hated about Season 1. One episode in particular pushes those problems even further, though mercifully keeps it much briefer in its depiction than the penultimate episode of Season 1 did. Jack Randall is a much less prominent character in Season 2—until he isn’t, but more on that later—, which feels like a breath of fresh air to a show that felt like it was abusing its audience whenever he was onscreen. 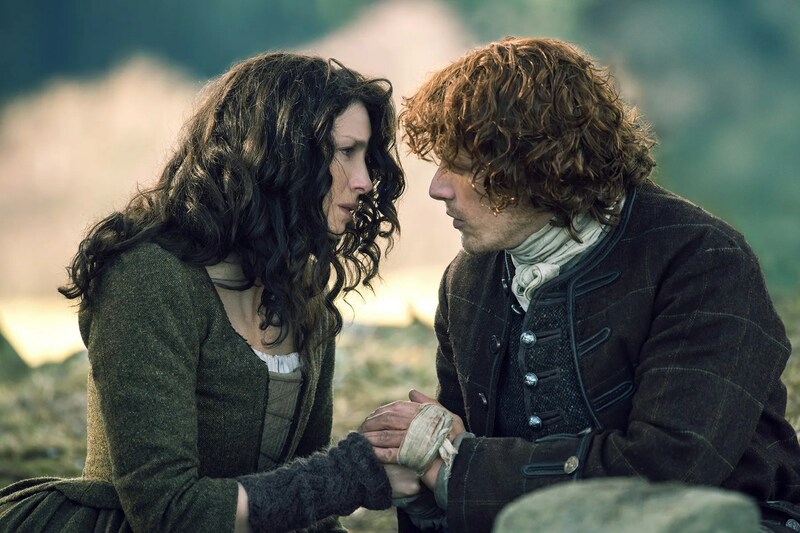 Season 2 opens with a scene of Claire returning to her 20th-century present, where she immediately discovers that all of her and Jamie’s efforts to prevent or change the outcome of the Battle of Culloden were unsuccessful. It’s one of those great narrative devices that gives us the ending first and then lets us experience the joy of learning how the journey to that ending goes. However, it also tells us right away that we’re in for an unhappy ending, one in which all of our heroes’ best-laid plans are profoundly determined to fail. That is especially evident in the second-to-last episode, in which Jamie says “This revolution was doomed from the start.” What we’re shown in this first scene is that, we can assume, the past (and therefore the future) are immutable, and we’re left to discover not what will happen in the future, but how that certain future will unfold. The first half of the season finds Claire, Jamie, and Murtagh (the secret star of Season 2) gallavanting around France in an attempt to manipulate various parties into not supporting the Jacobite rebellion, ensuring that the Battle of Culloden will never occur. Aside from the change of scenery and the lavish sets and costumes that come from setting the show in pre-Revolutionary France, these episodes are great for the way they give us Jamie and Claire working as a team. It almost feels at times like a season of House of Cards as the two work behind the scenes to pull strings in support of sabotaging a rebellion they’re ostensibly supposed to be supporting. Here we see a different side of Claire that continues throughout the season—a side that is perhaps less noble, more willing to be aggressively self-interested in support of the people important to her. She is willing to use people to meet these ends. We’re also introduced to a series of great new characters, including the menacing Comte St. Germain, the impish Bonnie Prince Charlie, the mysterious Master Raymond, and the lovable Dickensian scamp, Fergus. It’s a great change of scenery. And it’s there that the show becomes something beautiful. That shocking ending gives way to a final two episodes that are among the best, most well-written and moving television I’ve ever seen. It’s with these last two episodes that the show fully commits to being a time-travel story, one that blends that premise with the romantic epic it has been the whole time, in a narrative package with the heft of a Greek tragedy. There’s a great sense of doom and sadness over these episodes, as you’ve come to care so deeply about these characters and their fates. These episodes are so good not just because of the story being told, but because of how the creators are telling it: with brilliant editing that plays with time itself, surging ahead, cross-cutting between time periods in a way that gives us great scenes taking place in the future and then instilling an additional level of depth in them by showing us their relevant historical corollary. The thematic notions of time and fate come full circle as we watch through a series of narrative turns and revelations that fold in on themselves with beautiful symmetry and tragic dramatic irony. Everything is brought to a close. “They’re all gone,” Claire says mournfully in voiceover when she returns in the season’s first episode, casting a shadow over all the characters we’ll follow throughout the season as fate creeps ever closer. Even Jack Randall’s presence in Season 2 and the turn his character takes in the grand machinations of fate across the twelfth episode (almost) make up for that character’s portrayal in Season 1. It doesn’t become unproblematic, but it makes that problematic element feel small within the wheel of time that dooms us all. It doesn’t hurt that the actors in this show are doing such amazing work. The scenes between Claire and Jamie make this love feel real. I definitely cried multiple times during these last two episodes. The structure of the story, within war and a battle against time and fate, make this doomed love feel so big, so much like it matters in spite of what we consider the vastness of human existence. It feels like a microcosm of human existence itself, which we pour all of our energy into despite knowing it is less than the blink of an eye in the context of eternity, a notion of time we cannot even comprehend. The biggest issue with this finale is the inclusion of a new actress (Sophie Skelton) who is distractingly bad in comparison to how great everyone around her is. Good thing Caitriona Balfe is at the top of her game here as Claire. The artistic choices the show makes in terms of storytelling and editing in these last two episodes are bold and sophisticated, on par with The Leftovers and Master of None in their thrilling and emotionally-weighty audacity. What other show would devote such a huge chunk of its season finale to two characters whose presence had previously seemed so ancillary, but who ultimately fit so beautifully within the blood of the show’s lineage? There’s a really great exploration of both the metaphysical and quantum physical relation between time and space in this last episode that I loved. You’ll know the physical feeling of the weight of history if you’ve ever stood in a place like Aushwitz or the World Trade Centre memorial. It’s as if the ghosts of the past are there with you, haunting the space. In a quantum mechanical sense, maybe they are—all of eternity happening simultaneously. In light of this understanding of the show’s perspective on time, I’m thinking about that scene in the first season in which Frank confronts a ghostly figure that appears to be Jamie, staring up at Claire’s window in 1946. What if this is Jamie, standing in that same spot during a different time, the ghost of him somehow bleeding into that present moment? The season ends on a great cliffhanger, one that makes sense given the desire to continue this story further. However, these two seasons are such a perfectly-encapsulated narrative arc about time and fate and love and loss that that cliffhanger almost feels like it undermines how great the resolution is. We know when Claire emerges back into the 1940s that the child of Jamie she carries within her is the last part of him to exist. That, to me, is such a sad and beautiful fate for that relationship. I don’t feel the need for this story to continue. On the one hand, I want immediately to keep watching and find out where it goes, but on the other hand, I want to live in this bittersweet loop of a story forever. I guess if there’s one thing we can understand about time, it’s that no story ever truly has a resolution.